Welcome my latest skincare treat: DIY Anti-Acne Moringa Oil Face Serum Recipe! Not only will this oil and recipe help deal with acne, it’ll also help fade acne scars! Truly, I think any good face serum should do that… What? “Face serum” I say? Yes, I treat my acne always with OIL! Your skin naturally produces oil (AKA SEBUM) so anyone who’s constantly stripping away that natural, needed oil… Well, they don’t have happy skin. 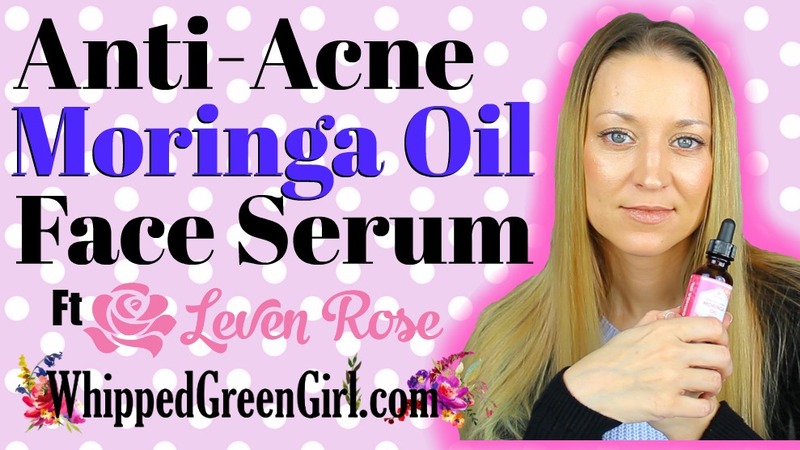 Non-video fans… As usual, here’s the full BLOG POST, featuring my: “DIY Anti-Acne Moringa Oil Face Serum” recipe found below. Moringa oil comes from a tree that grows in Africa/Asia… Long hailed as great for smoothing skin! Overall it’s very calming and clearing on any complexion. You’ll often see moringa oil get compared to argan oil… But, moringa is much lighter when applied, making it soak-in to skin fast! Also making it a great choice for ANY skin types! Personally, I always buy my facial oils from Leven Rose. Quality, price, purity – you’re guaranteed to be getting it there! Don’t believe me, just google Leven Rose… A+ reviews are a plenty! Proof there’s crappy, knockoff’s out there… I just bought a bottle of moringa seed oil off another site. What a mistake… Seriously, it’s got weird, crap floating in the bottom of my bottle. Pictures will never do it justice, but yea… Nope, it’s not going on my face. I’ll stick to Leven Rose from now on! Smell: Kind of nutty… Personally, it reminds me of the smell of cutting open a pumpkin on Halloween! Often, carrier oils have max. 6 months shelf-life. Not moringa, there’s so many antioxidants in it. This oil won’t go rancid for a few years after being produced. Making it a super popular choice for health and beauty products. 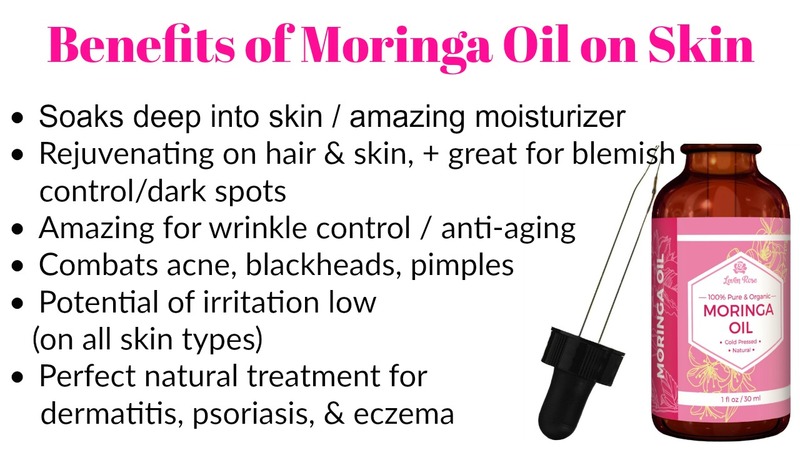 First, people love using moringa oil for hair + scalp treatments! Easily, massage a bit of oil into your hair + scalp for a few minutes (wash-out). This little tip will help treat dead ends + dandruff! Second fav moringa oil trick… Makes for a perfect, make-up primer! Today though, I’m sharing my own, favorite: “DIY Anti-Acne Moringa Face Serum” recipe! I love using moringa on my skin to fight acne! And this serum recipe will do just that, fight acne but also help deal with acne scars too! Play around though, use more moringa or rosehip if that’s what your skin likes… DIY skincare is all about customizing to your skin’s benefit, right! Hope I made it easy to see why many claim “moringa oil is one of the most nutrient dense oils in the world“! All those antioxidants and fatty acids go deep into your skin and fight to keep it looking right! Crazy fact, this oil was so precious to Egyptians. It’s said they placed vases of moringa oil in their tombs, to be used in the afterlife! Sincerely a well-documented skin rejuvenating oil! Thanks for checking-out my “DIY Anti-Acne Moringa Oil Face Serum” recipe. Hope it does your skin & body well! See more of my DIY SKINCARE if you like this one!